The Kangxi Emperor is considered by historians to be one of the greatest emperors in the history of China. He was the fourth emperor of the Qing Dynasty. He ruled for 61 years making him the longest-reigning Chinese emperor. His rule was a period of expansion, stability, and prosperity for the Chinese Empire. Kangxi was born on May 4, 1654 in Beijing, China. His father was the Shunzhi Emperor of China and his mother the Empress Xiaokangzhang. The name given to him at birth was Xuanye. 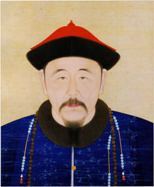 Although Kangxi was the third son of the emperor, he was considered the crown prince because his mother was a higher rank than the mothers of his brothers. He was raised mostly by his grandmother, the Grand Empress Dowager Xiaozhuang. Growing up, Kangxi enjoyed sports and hunting. In 1661, when Kangxi was seven years old, his father, only 23 at the time, died of smallpox. Despite being only seven, Kangxi was crowned the new emperor of China. At first, he didn't get involved in the government. There were men called regents assigned to run the country for him. By the time Kangxi turned 15, one of the regents, a man named Oboi, had become very powerful. He had the other regents removed or killed. Kangxi's grandmother advised him it was time to take control. Kangxi had Oboi put into prison and began ruling as the emperor of China in 1669. Throughout his long reign, Kangxi was a hardworking emperor. He wanted to strengthen and expand China. He also wanted what was best for his people. One of the first issues Kangxi had to deal with was the Revolt of the Three Feudatories. This was a civil war that broke out when three southern warlords united against Kangxi and the Qing Dynasty. The war went on for eight years, but Kangxi was able to suppress the rebellion and keep China united. One of Kangxi's main goals as emperor was to expand the Chinese Empire. He successfully conquered Taiwan, established a treaty with Vietnam, gained control of the Amur River region from Russia, and defeated the Mongols. Kangxi also had an impact on Chinese culture. He brought in Jesuit missionaries from the west who introduced new technologies, worked as translators, and ran the imperial observatory. He also had a new Chinese dictionary written known as the Kangxi Dictionary and compiled a collection of Tang poetry called the Quan Tangshi. Kangxi fell ill during the winter of 1722 and died. He named his fourth son, Yinzhen, as his successor. Yinzhen took over the throne and became the Yongzheng Emperor. Kangxi is considered one of the most competent emperors in the history of China. His reign led to a long period of peace and prosperity in China. His grandson, the Qianlong Emperor, would have ruled longer but retired in order to honor Kangxi. The name "Kangxi" means "Peaceful Harmony." Kangxi personally led the Chinese army against the Mongols. He is listed as having 24 sons and 12 daughters. At first Kangxi was receptive to Christianity and may have even become a Christian himself, but he later banned Christian missions in China.